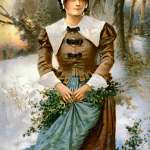 With Thanksgiving just days away, it seems appropriate to spotlight a name that would’ve felt right at home around the the Pilgrims’ first table. In point of fact, while Humility, Desire, Love and Resolved were all aboard the Mayflower, no one wore this virtue name for the crossing. Thanks to Corinne for suggesting our Name of the Day: Faith. We sometimes think that Faith is a much older name. That’s because Saint Faith lived in the third century and met her ending under the Diocletian persecutions in the early 300s. Trouble is, her name was probably Foye. It’s sometimes modernized as Faye or Fay, but Faith has become the most common version. Because her relics were kept at the Abbey of Sainte-Foye, and remained there for centuries, we can be fairly confident about her correct appellation. There’s also a little etymological story. Faith comes from the Latin fides for trust or belief, but was not applied to religious beliefs until around 1300. People had faith before the fourteenth century, of course, but they weren’t using that term to describe it. So it’s quite unlikely that anyone would’ve adopted Faith as a name. Instead, Faith became a name in the 1600s, when the Puritans opted for names representing their distinctive world view. 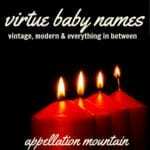 Along with lesser known Biblical choices, they opted for word names, especially virtue names. Faith was among them, and she remains one of the easier choices to wear. It’s worth noting, however, that even the most devout Puritans still called their kids Mary and John. Faith became most popular in the late 20th century. Faith ranked in the US Top 1000 most years from 1880 onward, but at the outer limits. Not until 1922 did she enter the Top 500. She inched her way up the charts, arriving in the Top 100 in 1999, finally peaking at #49 in 2005. Last year she came in at #74. She’s right at home with other simple virtue names like Grace and Hope. In fact, Faith and Hope is among the most popular combinations for twin girls born in the US – 32 pairs were born last year alone. Today, Faith has an appealing musical undercurrent. There’s George Michael’s hit single from the late 1980s, plus songstresses Faith Hill and Faith Evans. You’ll also find some unlikely candidates wearing the name. A DC Comics telepathic heroine and one of Buffy’s fellow vampire slayers are called Faith. There’s also a British shoe retailer called Faith. Overall, we find Faith strong and appealingly tailored. She’s quite popular, and maybe her history is shorter than some might imagine. But this doesn’t detract from her simple, straightforward nature. Faith is a good girl, but that’s not a bad thing. Considering my atheism, Faith is not a name for my kids. I don’t particularly like it on others, either. Most virtue names annoy me – you can’t make a personality happen. I find it similar to naming your child Lawyer or Princess. It’s not my style, I guess. For the record, I am so sick of seeing Hope and Grace as middle name options, too. I’m ready to write of all those names, to be honest. I like Faith and Grace, I have no problem with the religious meaning, but they are just a little boring to me.. Amity, Verity, Felicity and Clementine are more interesting and anyway, usually I like a longer name. Almost without exception, I adore virtue names. I don’t know why because I’m not usually one for such overt displays of meaning, but for whatever reason virtue names feature heavily amongst my favourite names: Grace, Constance, Clementine, Felicity and Verity (I could go on!) I can’t pin it down but something about these names feels so calm, peaceful, hopeful and resolved. I like Faith, she’s just not for me. Like Lola, I’d likely sooner use several other of the virtue names. It’s not her fault, either: being secular, I just shy away from the (very) strong Christian associations that name would have here where we live. I also find twin names like Hope & Faith decidedly corny, but darn it, they’re just so optimistic I can’t help but like them. Faith remains one of the few Virtue names I like. Don’t love, but deifnitely like. while I’m more apt to use Clementine, Amity or Verity (yep, I love that virtue!) But Faith is the one popular one I can like. Probably because Faith has many faces. Faith is not just Christian in orientation. I’m Wiccan and have Faith equal to that of my Catholic Mother. I find her pretty, sweet and definitely stronger than Grace or Hope. A simply lovely moniker, even today. Maybe especially today. […] style in the 1970s.